Everyone loves playing games, be it online arcade games or the latest casino games, which is why so many go to Vegas and try their luck in gambling however not all can go to Vegas so others try some alternatives. Due to release of Nintendo Casino Games several people find their fortune in this game and later they find out that this is more exciting. This video game is based in casino and gambling such as black jack, roulette and poker. This is often played online against other players or artificial intelligence. 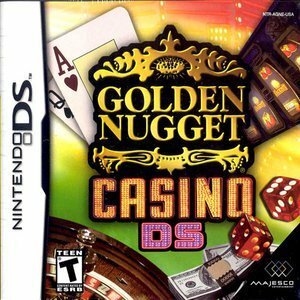 One of the most played Nintendo casino games is the Golden Nugget Casino DS. This video game was released by Majesco Entertainment last 2005 for Nintendo DS. 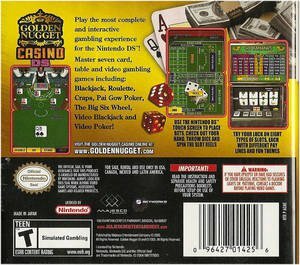 Golden Nuggets Casino DS is the ultimate Nintendo Casino games. It allows the player to experience gambling at its best without going to Vegas. It features classic casino options such as blackjack, poker, roulette craps, the big six wheel and traditional slots. You don't need to be a master in cards to conquer this game, many starts from scratch and speedily learn. Start with $5000 balance and watch your luck rise. It is very exciting to play because just like in real casino you can also place bets, check out your hand, throw the dice and spin the slots through Nintendo DS touch screen. It gives satisfaction to every user because it has eight types of slots that vary in number of reels, pay lines and fun themes. So if you want to experience the thrill and excitement of casino games, try Golden Nuggets Casino DS. No other video game can give you the best casino experience than this.